Second from bottom Carrick picked up a useful point in this draw with Glentoran. 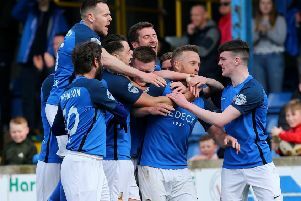 It moves Rangers five points clear of basement side Ballinamallard United, who lost at Ards. Glentoran were happy to take a point having lost three in row. It had looked as though they were going to take all three points after holding on for most of the game to an early header from Eric Foley. But Carrick snatched a point with a 90th-minute equaliser scored by Lee Chapman.